The ultimate ankle boot, this style really has it all. 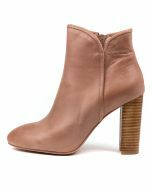 A tall stacked heel and sleek silhouette make this shoe inimitably elegant, with only the raised outside seam adding a touch of detail. Featuring an inside zip and almond-shaped toe, this is a classic you'll never tire of wearing.